So ….. these faster than light neutrinos are still setting the science world ablaze. 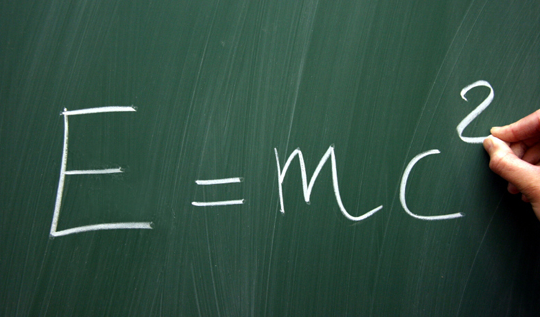 Does this really mean we have to consign the most recognisable scientific formula in world ever to the rubbish bin ??? Personally, I think not. Well …… not quite yet anyway. Although there have been subsequent runs from CERN to Gran Sasso that certainly appear to verify the initial findings of a neutrino stream travelling faster than light, I still think its too early to to give categorical results. Don’t get me wrong, history is filled with instances of scientific discovery that people at first scoffed at, strongly refuted and resolutely refused to believe, but in this case, the general consensus seems to be that the error margins are currently too high between the point of particle creation and detection to give totally conclusive results. It will be interesting to see the results of Fermilab’s Minos Plus runs which are due to begin within the next six months to a year. In the mean time, lets cut old Einstein a little slack. He has, after all, been one of the single most influential figures in the human understanding of the way the universe works.